Sensors for liquid level monitoring are typically divided into two categories – those which are used for continuous measurement of the amount of fluid and those which determine if predetermined level has be reached. A common example of the former is for fuel levels in vehicles and water tank over-flow indicator for the latter. Float – The underlying principle for float sensors is the use of a mechanical switch which closes or opens due to the rise or fall, respectively, of the liquid level. The detection mechanism can be as simple as indirect or direct linkage (e.g., a float ball and metal arm in a toilet tank). Float sensors are direct measurement devices, which are placed in contact with the liquid and are used for point level detection. One provider of float switch assemblies is Fluidswitch . Optical – Similar to floats, optical sensors are also direct measurement sensors placed in contact with the liquid for point level detection. The optical sensors use a light emitting diode (LED) to transmit an infrared beam to a paired receiver. By detecting a decrease in the beam intensity when liquid is present, the sensor determines when a level has been reached. The advantage of an optical system over a mechanical float is that the optical is solid state with no moving parts. Omron is a highly rated optical switch provider. Conductive – Also a point level detection sensor which comes in contact with the fluid, a conductive sensor is solid state with no moving parts. This works only with liquids which are electrically conductive (e.g., water) as it uses a low-voltage, low-current to close an electrical circuit when the fluid level rises to fill the air gap between two electrodes. As with optical sensors, the conductive sensors are suitable for corrosive liquids. However due to the presence of electricity, this is not recommended for hazardous areas where a spark could cause ignition or explosion of the liquid (or its gas). A selection of conductive sensors can be found at SensorTechnics . Hydrostatic – This sensor in placed at the bottom of the container where the liquid is stored, typically a deep tank or reservoir. The weight of the liquid on the sensor is used to calculate the height of the column of liquid. The calculations take into account the type of liquid, as the specific density (“weight”) of the liquid can be different (e.g. water has a higher specific density that gasoline), and typically also compensates for variations due to temperature (e.g., a reservoir of water is warmer in summer, with a different specific gravity that in winter). 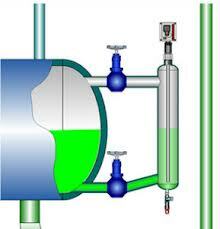 It’s worth noting that hydrostatic pressure sensors are best used for very large volumes of liquid. RF / Capacitance – These are also referred to as Admittance level sensors. These circuits use a radio wave in the MHz frequencies to create a very low alternating current (ac) circuit through the liquid. The conductivity of the circuit, termed admittance for ac, is measured to determine the liquid level. The conductivity will change based on the liquid level, and using a conversion table of level versus conductivity, the level is calculated. The sensor is in contact with the liquid, but this method uses an indirect measurement (e.g., the conductivity) to determine the level. Monitor supplies RF sensors. Ultrasonic – This is similar to RADAR for detecting moving objects, although much simpler. High frequency acoustic waves in the 20 KHz to 200 KHz frequencies directed at the liquid and the reflected signal is detected at the transmitter. Using a table which translates the time it takes a particular frequency wave to travel in open air, the distance from the transmitter to the surface of the liquid is calculated. Since the distance to the bottom of the liquid is already know, simple subtraction yields the level of the liquid. An distinction for ultrasonic sensors from those previously discussed is that this is not in contact with the liquid. One supplier of ultrasonic sensors is Omega . This overview only discussed the fundamentals of the most common liquid and fluid level sensors. For more details on the specific sensors and product reviews, please see our other related articles on this site.